The lightning arrestor is connected to a conductor which runs along the walls and goes into the earth. surge arrestor gives the protection against surge current or voltages in a circuit. Surge can be produced because of short circuit, lightning, sparking etc. A surge arrestor is a device to protect electrical equipment from over voltage transient caused by external (lightning ) or internal ( switching ) events...Th same kind of induction happens in overhead and above ground conductors which experience the passing energy of an atmospheric EMP caused by the lightning flash. A lightning arrester is a device which is used on electrical power systems and telecommunications systems to protect the insulation and conductors of the system from the damaging effects of lightning. The typical lightning arrestor has a high voltage terminal and a ground terminal. When a lightning surge ( or switching surge , which is very similar ) travels along the power lines to the arrester , the current from the surge is diverted through the arrestor, in most cases to earth. 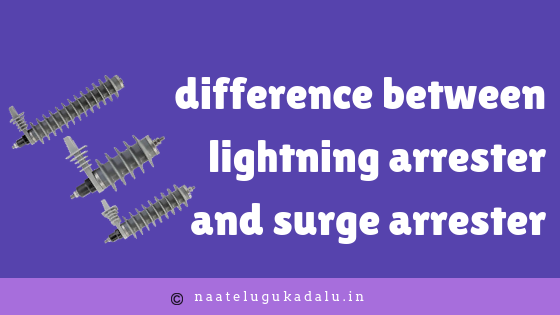 There are different type of lightning arresters in general use. They differ only in constructional details but operate on the same principle, providing low resistance path for the surges to the ground. The arrester should be connected to ground to a low resistance for effective discharge of the surge current. The arrester should be mounded close to the equipment to be protected and connected with shortest possible lead on both the line and ground side to reduce the inductive effects of the leads while discharging large surge current.